Reggie is a nine-year-old crossbreed who visited The Vet Morden as his owner was concerned about a red raised area on his left chest. Reggie recently had a mast cell tumour removed from here and so they had concerns about another mass returning of a similar nature. From the examination, there were two areas which were identified, one that was raised and red in appearance and one below that. After discussion with his owner, it was decided to take Reggie to surgery. 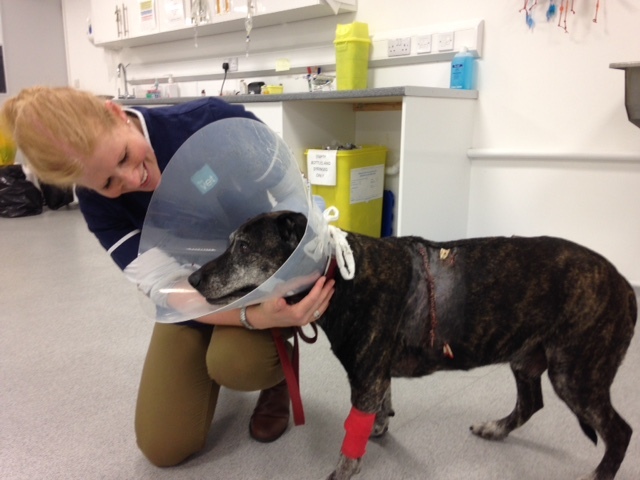 His owner understood the vet would remove as much tissue as possible in case this was a similar tumour as Reggie had previously. On the day of his surgery Reggie had x-rays taken of his chest area and stomach to check for any other areas of concern which could relate to the mass on his chest. 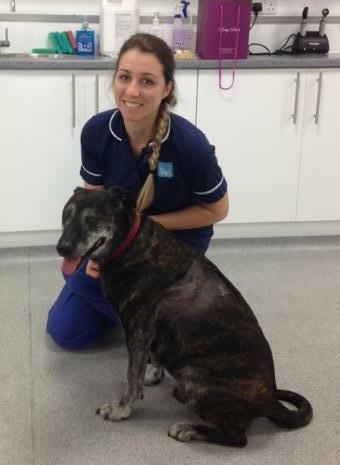 He had a pre-anaesthetic blood test to check his overall health prior to surgery as well as being placed on fluids before, during and after his operation to support his body. His x-rays were normal so he was taken to surgery. He coped really well under general anaesthetic and both masses were removed. A drain was placed to reduce the likelihood of fluid build-up under his skin post-surgery and this was removed just over a week later. Reggie has now fully recovered and is doing well.